For thousands of years, dogs have been our best friends, our protectors, and often our heroes, improving and even saving our lives. That is why each October, American Humane, the country’s first national humane organization and the nation’s leading first responder for animals in need, encourages animal lovers to repay the favor by adopting a dog from a local shelter or rescue group during its annual “Adopt-a-Dog Month®.” This year, American Humane is teaming up with Hallmark Channel’s “Adoption Ever After” campaign to help get more of the millions of beautiful animals left in shelters each year into forever homes. All throughout the month, you can go to www.AmericanHumane.org to find adoptable dogs in your area, tips on preparing your home for a new four-legged companion, other vital information, and social media campaigns and blogs to help build a better world for our best friends. If you’re already a dog lover, or just need an extra push to bring home a pup waiting for your love, be sure to tune in to this year’s American Humane Hero Dog Awards on Hallmark Channel October 24 at 8pm ET/PT (check local listings for exact date and time). The heartwarming stories of amazing dogs (including rescued shelter dogs) who improve and even save our lives will make you realize that every dog is a hero and every hero needs a home. 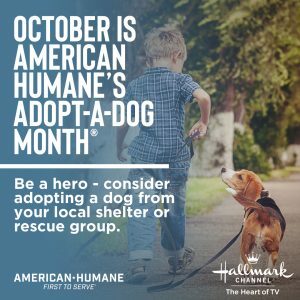 Make this the month you bring your hero home, watch the Hero Dog Awards, and spread the word with the hashtag #adoptioneverafter. When you’re ready to open your heart and home to a new best friend, adopt from your local animal shelter or rescue group. Talk with shelter staff to find the perfect dog for you and your lifestyle, and remember that older dogs make excellent pets too. Have your dog spayed or neutered, thus preventing the possibility of unexpected, and potentially unwanted, puppies. Spayed and neutered animals have been shown to lead longer, healthier lives and have fewer of certain behavioral problems than animals who have not been spayed or neutered. By putting identification on your dog, either in the form of a tag, a microchip or both, you will reduce the possibility that your pet will become one of the presumably “homeless” dogs that end up at your local shelter. Only 15-20 percent of dogs who enter a shelter are reunited with their owners. Make sure your dog is one of the fortunate few by outfitting him with proper identification! Show the pets at your local shelter or rescue group that you care by donating time, money or supplies like pet food, leashes, beds and toys. Call the shelter to see what supplies or services are needed most. Even the smallest effort can make a difference. American Humane is the country’s first national humane organization, founded in 1877. To learn more visit us at www.americanhumane.org today.